The oval cut diamond, first popularised in the 1960’s, was an attempt to create a fashionable alternative to the popular round cut diamond. The elongated shape of the diamond in oval rings allows the illusion of length, and is perfect for an engagement ring. 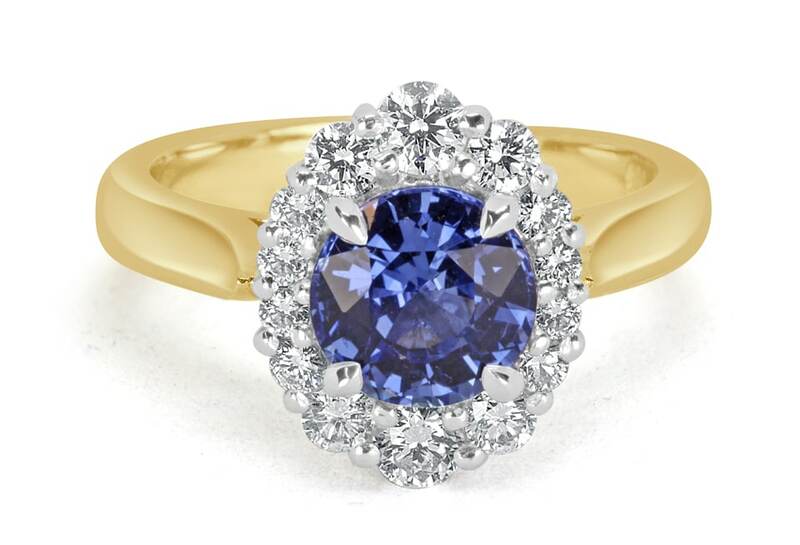 The oval is a brilliant cut diamond, and like the round generally has 58 facets, thus reflects light brilliantly. There is no set standard for the length or width for the diamond of oval rings, from long and lean to almost round – you can choose one that fits your hand perfectly. Unique and romantic, the curves of oval rings are distinctively feminine, and it is fashionable to set oval rings in rose gold to give them a vintage feel. The oval is an organic and distinctive shape, not as simple or constructed as the circle, while still not including any sharp edges or harsh lines. Oval as a term is derived from the Latin word ovum, meaning egg, so the oval shape has come to symbolise fertility, rebirth, and occasionally immortality. Oval rings as engagement rings can perfectly signify the beginning of a new life together. Oval rings have long been seen as an outward sign of fertility and a flourishing marriage. If you and your partner want children, oval rings are a perfect way to symbolise a future family. Oval rings and their shape are also seen as symbols of life and rebirth. Oval rings can be an excellent choice for a second marriage, by symbolising a new life. Oval rings perfectly represent eternal love as the shape is associated with immortality. Oval rings have many other meanings aside from the traditional symbolism. The oval shape is not a perfect circle nor does have any hard edges. Oval rings are often chosen by those couples who like to think outside the box, but have a taste for the traditional. Oval rings can symbolise that all-important promise of forever. It is not only the shape of the ring that holds traditional symbolism, but the stone, the main focus of the ring, can also carry heavy symbolism, often far more than just a pretty colour. Birthstones are often chosen as a personal touch to a gift, or for yourself. At GN Designer Jewellers in Melbourne, our ring makers focus on remarkable and dazzling custom-made rings. You can always expect outstanding service and exceptional artistry when you deal directly with a private jeweller in our Melbourne store, where we have a stunning studio, workshop, and showroom. Before visiting we encourage you to browse our extensive gallery of beautiful oval rings and ring designs to inspire you, and you can contact us directly with questions and speak with an expert. The team of professional jewellers at GN Designer Jewellers in Melbourne can help you in designing your very own bespoke oval rings. We will incorporate any ideas, imagery or other design thoughts you bring with you to your no-obligation design appointment. Our jewellers will offer expert design advice and create something genuinely individual that captures your vision. GN Designer Jewellers in Melbourne has been one of the best in the Australian jewellery industry for more than 20 years. We adhere to strict standards when it comes to jewellery making, offering our customers meticulously handcrafted oval rings created with precision and care. We have of a large selection of diamonds and gemstones that have all been certified by the Hoge Raad voor Diamant, also known as the Diamond High Council, or more commonly the HRD, the Gemological Institute of America (GIA), and Auscert. The founders of GN Designer Jewellers built their business from the ground up, mastering their craft, and they have shone continuously in the industry, much like their diamonds. The team at GN Designer Jewellers will take the time to create or choose from our extensive range of expertly handcrafted items to find the perfect stone for you. For more information about our oval rings in Melbourne, you can contact us on (03) 9602 2153, or stop by our store located at 62 Hardware Lane, VIC Melbourne Australia.